It's that time of the year again, where the streets of Little India are awash with festive glittering lights and filled with bustling night markets. Deepavali, which translates directly to "row of lights", is also dubbed the Festival of Lights and will be celebrated on 2 November this year in Singapore. It is the celebration of good over evil, light over darkness, after Lord Krishna defeated the tyrannical ruler Narakasura and brought peace back to the kingdom the latter ruled. This festival is mainly celebrated by the minority Indian community, the Tamils. They dress in traditional costumes and visit local artists to paint their hands with traditional henna art. Henna is a flowering plant that is used to dye hair, skin and clothing. In the heart of the local Indian community, Little India, the festival is kicked off with a light-up of the district, followed by traditional parades, bazaars and cultural performances. Stalls in the night markets are decorated with fragrant flowers, garlands used in prayer sessions and oil lamps, while Indian women are decked out in vividly-coloured saris and intricate gold jewellery. In fact, the merry-making of the festival is so infectious that we here at ZALORA have gotten into the spirit of things too. Check out our offerings for this special period only. 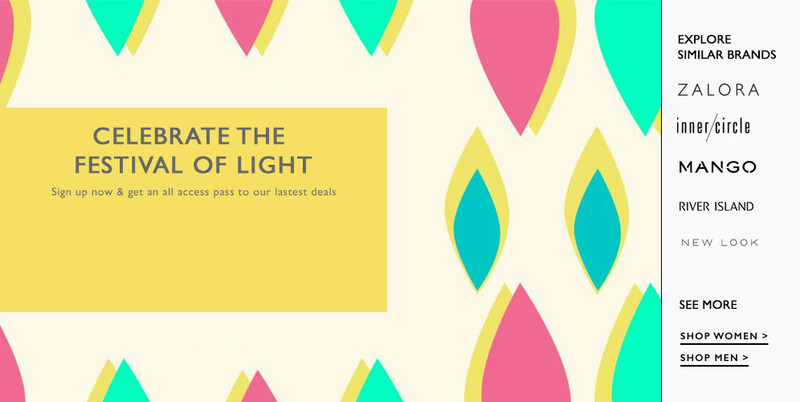 May your shopping exploits be filled with light this Deepavali here at ZALORA!